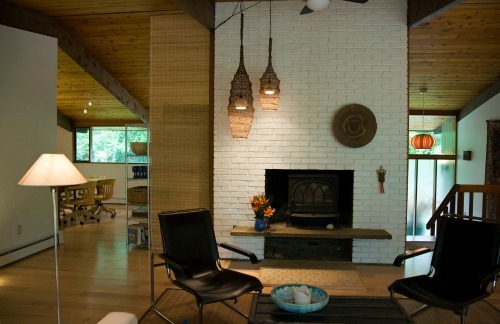 Painting interior brick is a popular home design trend at this time and a great way to give your home a quick facelift. First, there are the brick “purists” who believe you should maintain the integrity of brick by leaving it alone no matter what! This is because paint is nearly impossible to remove from brick. Than there are those who believe that the red brick look is out-dated and should be covered with paint, sheetrock, or tile. If you are preparing your home for the real estate market, be sure to use interior paint colors in shades of white or soft neutral colors. See interior colors for home staging. 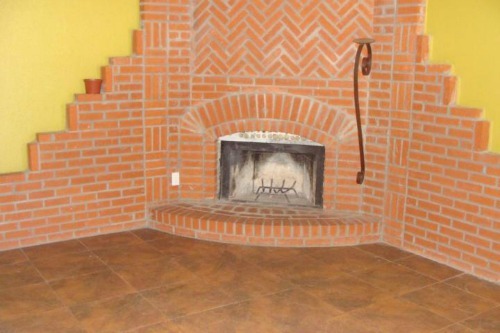 Painting interior brick is also a great way to camouflage a massive or hideous fireplace, like the one in the picture below. Painting an ugly fireplace and adjacent walls the same color will minimize it's presence. 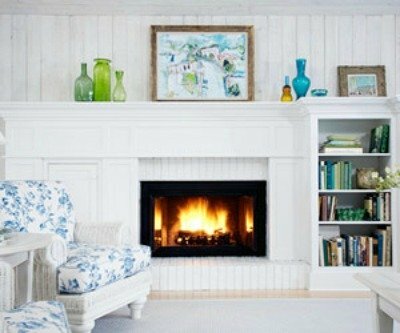 Painting a huge brick fireplace the same neutral color as the walls next to it will make the fireplace appear to recede, or blend into the walls. 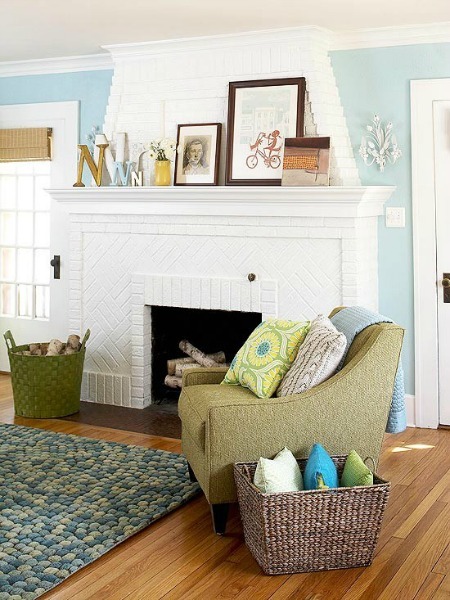 This is a home staging trick that fools the eye into making the brick fireplace appear to diminish in size and importance. A vast brick wall that demands too much attention can be toned down when it is painted in a light neutral color. The neutral color will create a perfect backdrop for groupings of artwork. Step 1: Protect the surrounding area of the fireplace with a drop cloth or piece of heavy plastic. Tape off any areas with plastic you don’t want to paint, like fireplace inserts and walls. Step 2: With a wire brush, scrape away loose mortar and efflorescence, if any. (Efflorescence is that white stuff that leaches out of brick— deposits of salt buildup). Vacuum up the mess before moving on to the next step. NOTE: If your fireplace has efflorescence, wait to see if it comes back after cleaning. If so, you probably shouldn’t paint over the brick, as the efflorescence could be caused by moisture inside the brick. Step 3: Next, using a nylon bristled scrub brush, clean the surface of soot and dirt with mild soap and warm water, or spray the fireplace with a 50/50 mixture of water and vinegar and wipe off with a rag. To remove cigarette smoke residue, use TSP, (trisodium phosphate). Mix 1/2 of TSP to 2 gallons of water. Be sure to wear goggles and gloves for protection when working with TSP. For stubborn soot, spray with “Johnson Scrubbing Bubbles Bathroom Cleaner” and leave on for about 5 minutes. This product works really well on soot! Repeat, if necessary. Johnson Scrubbing Bubbles will also get rid of mildew on the fireplace. If you plan on painting the inside of the fireplace, be sure to clean it, as well. After cleaning, let the brick and mortar dry completely for up to 24 hours. The brick may feel dry on the surface but could still be damp inside, so give it plenty of time just to be safe. NOTE: Wait at least 1 year before painting brand new brick. This allows the brick to dry fully. Don’t be cheap when buying paint for brick surfaces! A high-quality paint is crucial to achieving a successful finish when painting interior brick. For the final coat, select a 100 percent acrylic paint with a semi-gloss finish. A slightly glossy finish looks better, and will highlight the texture of the brick more than a flat finish will. Sherwin-Williams makes a great breathable latex paint, called “SuperPaint Acrylic Latex. Step 1: You’re ready to prime! With the paint roller, start painting from the top of the fireplace or wall and work your way down. Next, using the small brush, work the paint into the cracks and crevices. Let it dry completely before painting a second coat of primer. Step 2: Repeat the process with the latex paint. Be sure that the paint is rated to withstand temperatures up to 200 degrees F. Apply additional coats as needed. Don't use this paint on the interior of the fireplace. The firebox will require a more heat-resistant paint. For a video demonstration on painting a brick fireplace, watch below. Thank you Buildipedia for this instructive video!